NEW: Al-Maliki's spokesman says his remarks were "misunderstood"
(CNN) -- A German magazine quoted Iraqi Prime Minister Nuri al-Maliki as saying that he backed a proposal by presumptive Democratic presidential nominee Sen. Barack Obama to withdraw U.S. troops from Iraq within 16 months. Nuri al-Maliki told Der Spiegel that he favors a "limited" tenure for coalition troops in Iraq. "That, we think, would be the right time frame for a withdrawal, with the possibility of slight changes," he said. But a spokesman for al-Maliki said his remarks "were misunderstood, mistranslated and not conveyed accurately." Government spokesman Ali al-Dabbagh said the possibility of troop withdrawal was based on the continuance of security improvements, echoing statements that the White House made Friday after a meeting between al-Maliki and U.S. President Bush. In the magazine interview, Al-Maliki said his remarks did not indicate that he was endorsing Obama over presumptive Republican presidential nominee Sen. John McCain. "Who they choose as their president is the Americans' business. But it's the business of Iraqis to say what they want. And that's where the people and the government are in general agreement: The tenure of the coalition troops in Iraq should be limited," he said. 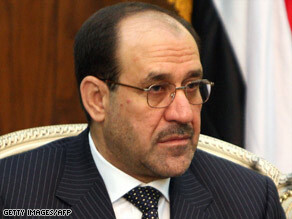 "Those who operate on the premise of short time periods in Iraq today are being more realistic," al-Maliki said. The interview's publication came one day after the White House said President Bush and al-Maliki had agreed to include a "general time horizon" in talks about reducing American combat forces and transferring Iraqi security control across the country. iReport.com: What should the next president know about Iraq? The Bush administration has steadfastly refused to consider a "timetable" for withdrawing troops from Iraq. In a statement issued Friday after a conversation between Bush and al-Maliki by closed-circuit television, the White House said that conditions in Iraq would dictate the pace of the negotiations and not "an arbitrary date for withdrawal." The two men "agreed that the goals would be based on continued improving conditions on the ground and not an arbitrary date for withdrawal," the White House said. In an interview to air Sunday on "Late Edition," Secretary of State Condoleezza Rice told CNN's Wolf Blitzer that "those goals are being achieved now, as we speak. And so, it's not at all unusual to start to think that there is a horizon out there, in the not too distant future, in which the roles and responsibilities of the U.S. forces are going to change dramatically and those of the Iraqi forces are going to become dominant." White House spokesman Scott Stanzel said al-Maliki had made it clear that such decisions will be based on continuing positive developments. "It is our shared view that should the recent security gains continue, we will be able to meet our joint aspirational time horizons," he said. The prime minister's remarks emerged as Obama visited Kuwait and Afghanistan before embarking on a tour of the Middle East and Europe to boost his foreign policy credentials. He also plans to visit Iraq. The Democratic candidate says he supports a phased withdrawal of troops, promising to remove all combat brigades from Iraq within 16 months of taking office if he becomes president. He has been a strong advocate of the 2007 "surge" to escalate U.S. troop levels and says troops should stay in Iraq as long as needed. McCain says Obama is wrong for opposing the increased troop presence, and Obama says McCain's judgment is flawed. CNN's Julia Weber and Jamie Crawford contributed to this report.